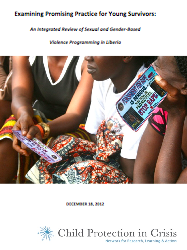 From May-August 2012, the CPC Network Program Learning Group (PLG) in Liberia conducted an integrated review of sexual and gender-based violence (SGBV) programs in Liberia to examine the methods and outcomes of current SGBV prevention and response interventions, and to identify promising practices that can inform the development of future program and policy initiatives. 279 documents were collected, and interviews were conducted with 40 key informants and 10 young female SGBV survivors. Only 12 documents were evaluations; 5 demonstrated measurable change in terms of shifts of knowledge or awareness of SGBV and related issues, or an increase in respondents accessing services. The document set does not provide a strong basis upon which to evaluate the presence of promising practices.